BUFFALO STAMPS AND STUFF IDEA. 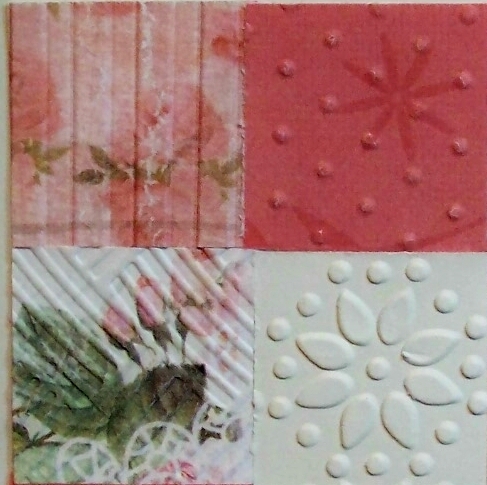 Today's idea is quilting on your card. I have seen a lot of different quilting designs on cards lately. This is a pretty simple one I found on Pinterest. card stock in patterns or colors that coordinate. You need four. four inch squares from each strip. You now have 16, 1 inch squares. I ran the squares through various Cuddlebug and Darice embossing folders. Figure out how you want them to look on your "quilt". Now start gluing them on the 4 inch square piece of card stock. I did the four corners first, then the outer edge and finally the four squares in the middle. Here is a close up of the embossed squares. ivory card stock. I ran a piece of green card stock 41/2 inches square through an embossing folder. I mounted the quilt which has been adhered to the ivory card stock to the green embossed square and adhered that to a 5x5 inch card. Colored twine bow on button. mix and match the patterns too. WOW!! This is gorgeous Sue. 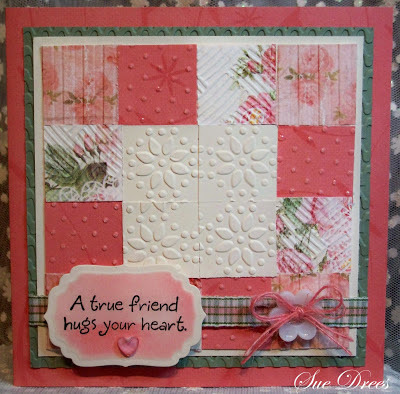 I really love the quilted design using a beautiful mix of different papers and embossing. The sentiment is lovely too. this is a beautiful patchwork card Sue. you have used beautiful papers. This is gorgeous. I love the quilt effect on this card. It's homespun happiness. Please transfer this pattern into a fabric one for my bed. It is only King Size. Oh I love every detail of this. Wow!